After an average opening weekend with the collection of 33.52 crores, Shahid Kapoor and Alia Bhatt starer ‘Shaandaar‘ crashed at the Box Office on its first Monday. The movie has been struggling at the Box Office from the first day itself and it was pretty much expected that it will drop on Monday. 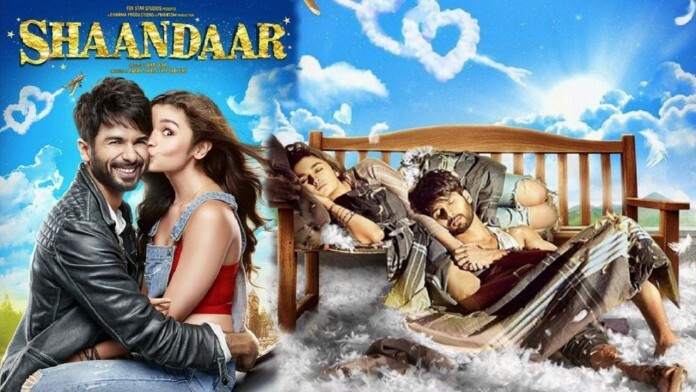 As per early reports, Shaandaar collected around 2.5 crores on its 5th day at the Box Office. This drop of around 80% compared to first day is the clear indication that the movie is thrashed by one and all. Shaandaar is mainly targeted to the multiplex audience. Single screens and mass centers are expected to be on a lower side, but the real problem is that the movie is struggling at multiplexes also. The total budget of Shaandaar is 75 crores including the promotion and marketing cost. The movie will find it extremely difficult on coming days as Pre Diwali phase start which is generally not considered a good phase for Bollywood. As per my expectations, Shaandaar will continue to struggle and may wrap up its Box Office journey within its first week. The movie is expected to be a flop with the lifetime collection of around 45 crores.